Drive north just over an hour to explore New Zealand’s picturesque Lake Wanaka. 45 kilometres long and dwarfed by towering mountains, arriving at Lake Wanaka is, like so much of New Zealand’s landscape, a breathtaking sight. With its own superb local skiing, snowboarding and heli-skiing, the small town charm of Wanaka delights and its quiet, inviting vistas inspire reflection. On the edge of the lake is Whare Kea, one of the most happily situated lodges you will find. Taking understated luxury into a new realm, the lodge’s glasshouse design brings the outside in and floods the cool interior with crisp light. Driving down the property’s tree-lined drive feels authentically ‘New Zealand’ as happily grazing sheep bleet from the roadside and occasionally meander towards the car. After crossing a very small airstrip, used by a neighbouring farmer who flies in from Auckland, you reach the lodge and its friendly staff is waiting to welcome you in. Only 12 guests can stay at a time at Whare Kea, ensuring peace and privacy, and included in the rate is a five-course dinner. Chef James Stapley grows much of the fresh produce in his own organic garden and individually named menus await you at the laid table. Homegrown vegetables served in miniature terracotta pots with black quinoa ‘soil’, foaming soups carried out on sawn off hunks of wood and a dessert of strawberries served every which way are some of the wonderfully creative elements of the chef’s repertoire. Not far from Whare Kea lies the famed Rippon Vineyard, a spectacular plot hugging the shore of Lake Wanaka and overlooking Ruby Island and the looming range beyond. The unique combination of the region’s high ultra violet light, long sunshine hours and highly refractive soils morph with a temperate climate and protected location to produce sublime Pinot Noir. Visiting the vineyard, it can be hard to tear yourself away from the mesmerizing view but head in to sample what’s on offer – there are tables outside to drink in the view and you can set yourself up nicely with some of their delicious wine and a local cheese board. A 35-minute boat road from the town of Wanaka sees you disembarking at Mou Waho Island, a nature reserve and great place to spot the local barrel-bodied Weka bird. Originally a site of early shipbuilding, European settlers populated the island with pine trees and other non-native plant species. A recent project has sought to restore all native growth back on the land and the trail is now peppered with Manuka and Kanuka natives. Climbing up towards the top of the island, you pass the Arethusa Pool, a small lake on the island itself. Standing on the shore of this pristine body of water, overlooking Mou Waho island, which is also on a lake, is kind of mind-bogglingly beautiful and a reminder of the wonder of nature. 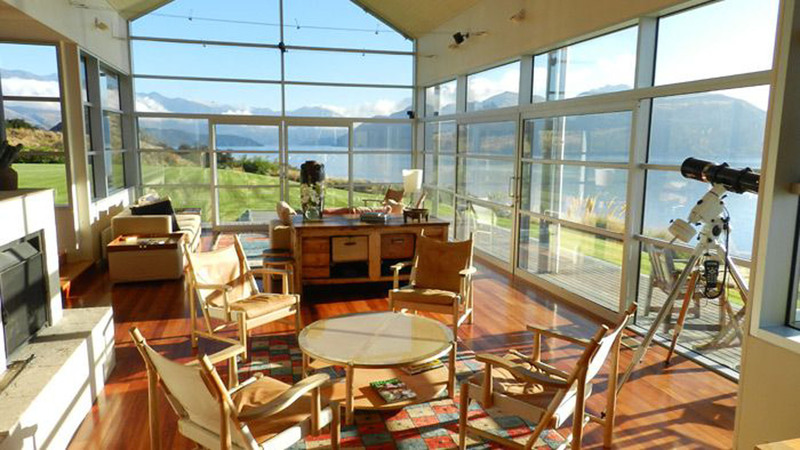 Reaching the very top of the island you are blissfully rewarded for your efforts with a 360-degree view of the expanse of Lake Wanaka and the mountains and valleys it fills. You will find a wide flat ledge at the top, a very well-worn platform that has no doubt been a resting spot for many a traveller as they sit and take in the magic of this spectacular part of the world. If a South Island snow adventure without the action of bustling Queenstown appeals, drive north just over an hour to New Zealand’s picturesque Lake Wanaka.